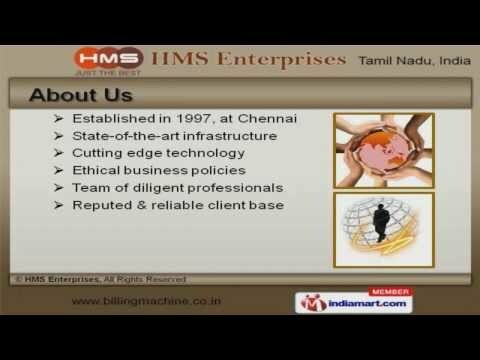 Welcome to HMS Enterprises, Supplier of Electronic Billing Machine, Weighing Scales and Paper Shredders. The company was established in 1997 at Chennai. State-of-the-art infrastructure and Cutting edge technology make us unique in the industry. Client centric approach, Industry leading prices and Hassle free installation make us the first choice of our clients. We offer a wide array of Billing Machines, Fake Note Detectors and Retail Scales. Our Packing, Counter and Bench Scales are best in the industry amongst others. We offer Crane, Pallet and Moisture Scales that are widely acclaimed in the market. Silver, Diamond and Pocket Scales offered by us are some of our best selling products. Along with that we offer Educational, Courier and Cargo Scales that are a class apart. We also provide Weigh Bridges and Billing Machine for Hotels that are acknowledged for their functionality.